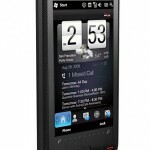 Another type of a mobile invading the market shelves is Verizon’s HTC Imagio. This one I think is here to stay. This touchscreen Windows Mobile 6.5 handset, or “Windows Phone,” as it is so called, is with a spec set, a 3.6-inch WVGA screen, Wi-Fi, GPS, a 5-megapixel camera, a 3.5mm headphone jack, and micro SD storage expansion though it does not come with a card. 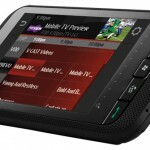 The first of its kind as a smartphone with V CAST Mobile TV, which is a Flo TV-based live streaming TV service, that gives an impression of a digital cable. But has an cute kickstand. The front of the device is as such with a perforated grille, that gives a protected feeling in your hand. The bottom row of buttons that say all, V CAST, Windows Start Menu, back and end call are placed further down so as to use it snugly. Those of you who are kind of used to HTC handset will not find it difficult to use this one. The over all functioning is good enough, but since it is the same as Qualcomm processor which has not been very popular, the 256MB RAM is nothing to talk about as it is almost the same like the HTC Touch Pro2. HTC’s put in a lot of efforts to see that TouchFLO does not run into any trouble. Nevertheless the hard ware could have been a wee bit better. The 5 megapixel auto focus camera, contributes to excellent picture quality of videoes, pictures taken do look good on the phone’s display, but tend to blur and foggy when enlarged. That in itself is a no so good thing happening as we all would like to see the taken pictures at its fullest entity. To think that this phone it not viable is an understatement. It definitely is on the right path for both Verizon and HTC. The ever so easy navigation and entrée to all the features on the handset, Windows Mobile 6.5 proves highly perceptive. The battery span will surly last over a day of 12 hours with sparing usage and WiFi disabled. Web tab gets you going to all your favorite sites which could take a bit of time. Loading the homepage of Digital Trends on the Verizon 3G network allows approximately 40 seconds to complete before the status bar vanishes. Conversely, the page without images shows up within ten seconds. Phone calls were crystal clear on both ends, with none of the echoing or dropped connections we’ve experienced on other phones recently. If you want to stay in the techno race, especially with the iPhone then Imagio has to correct a few technology updates then to have antiqued XT9 prognostic text options and should have a better stocked App store to add a few. But in spite of a few bads, this sure is an owners pride.